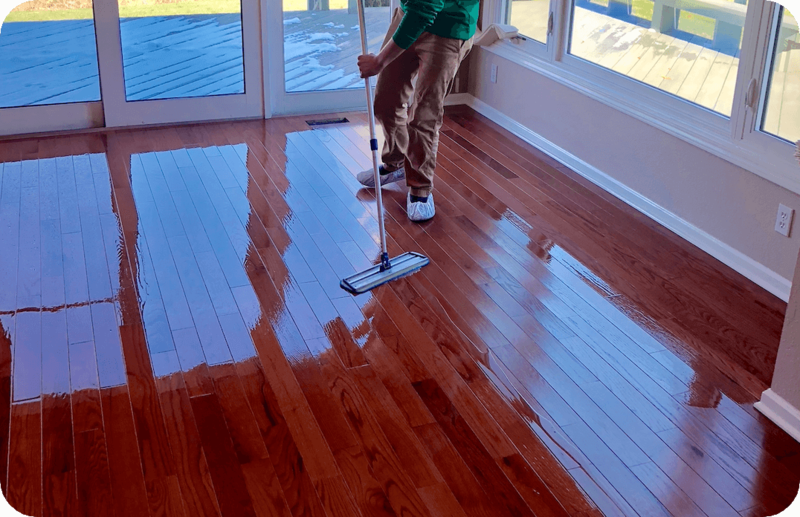 With the growing popularity of hardwood flooring in homes, there is an increased need for a professional cleaning method that will go beyond the capabilities of traditional mop cleaning. Steam Green's low moisture cleaning process has the ability to loosen and extract deeply embedded dirt that is not able to be removed through traditional cleaning methods. 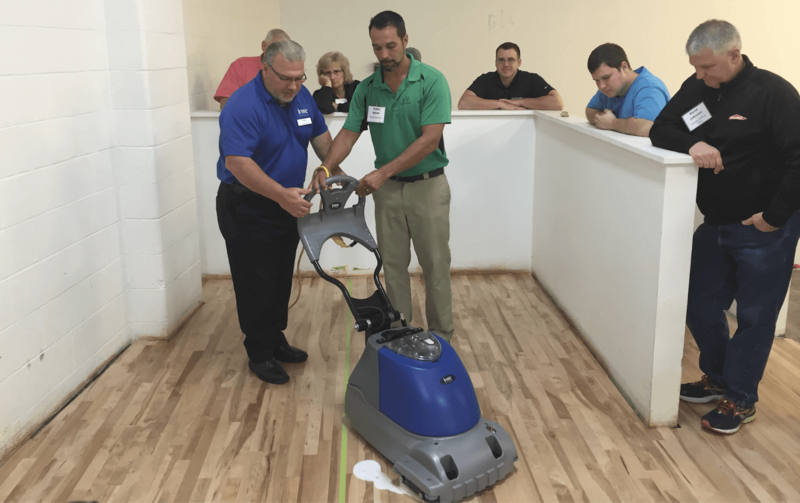 Our wood floor cleaning machine is designed to gently scrub the floor using a safe cleaning solution that emulsifies the dirt build up and breaks its bond with the floor surface for easy removal. There are many varieties of wood flooring options in homes today ranging from exotic to engineered hand scraped hardwood. Many floors are prefinished with varying degrees of urethane protective coating. This finish is there not only to protect the floor but, enhance it's beauty. With everyday use, it is important that wood floors are maintained properly, by frequent dust mopping and the use of neutral ph cleaners. When floors are left dirty, they may become damaged by abrasive dirt and begin to show signs of wear. Once the dirt has scratched beyond the finish and into the stain and wood itself, it will require sanding to restore to a new condition. 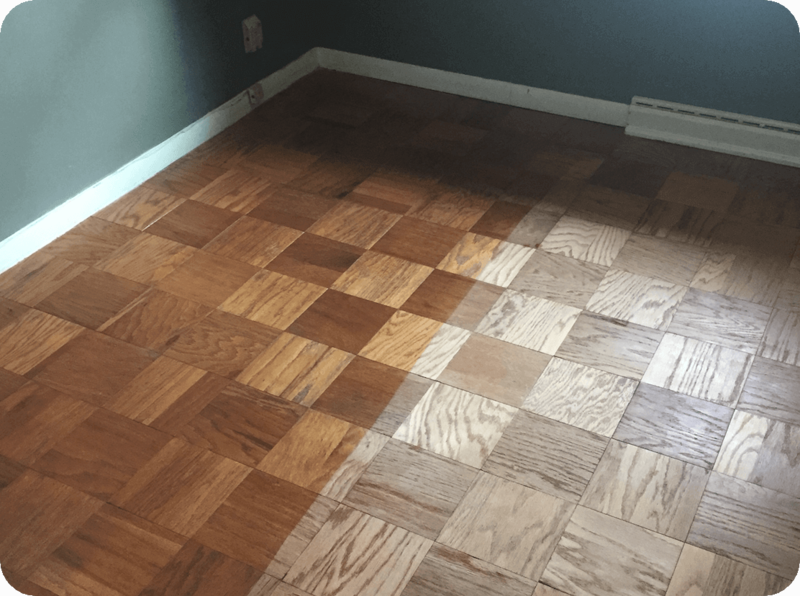 Our goal is to catch the floor as it begins to show signs of dullness and wear, so that we can restore it using our Dustless Refinishing Process. This saves you time and money and brings your floor back to its former beauty. • 90% cured in 24 hours, ready for use in 3 hours! • Higher durability than other products on the market, our products were originally designed for BOWLING ALLEYS! 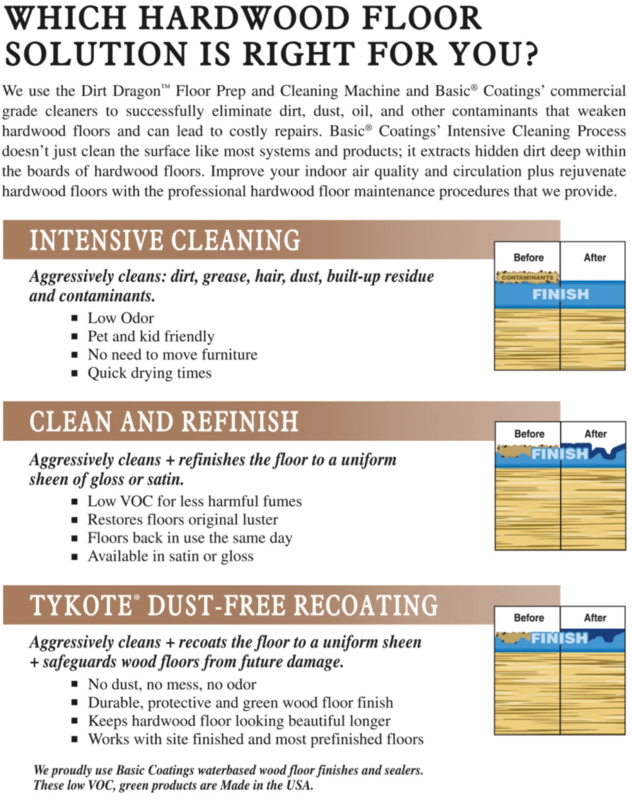 • Refinish a wood floor in just one day! Allow the floor to dry for a minimum of 1 hour before walking on it (wear socks for the first 24 hours). Wait 24 hours before heavy traffic and furniture replacement. Depending on humidity levels in the home, finish will be fully dry within 3 hours and 90% cured in 24 hours. Do not place carpet or rugs on floor for 2 weeks after floor is re-coated. Although the floor is 90% cured in 24 hours, the remaining 10% needs 2 weeks to finish curing. Placing rugs or a cover of any kind over the floor before it has cured can cause discolorations, softness, and/or luster change of the finish. A rubber honeycomb-type pad, which has holes in it, is most recommended because it allows the finish and floor to breathe. Avoid solid rubber or PVC backed rugs as they do not allow the floor to breathe. Do not use a stiff pad with hard cleats or grippers on the bottom as these can cause indentations in the wood. Do not use any liquid cleaners other than water for the first 2 weeks. Use a neutral cleaner (Steam Green Inc carries a neutral floor cleaner for sale). Use cleaner as directed for routine cleaning and maintenance once the 2-week window has passed. 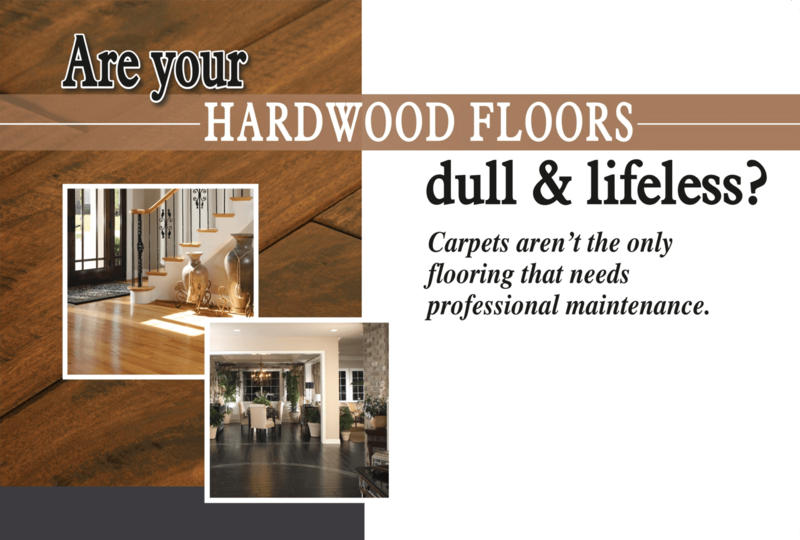 • If areas of your floor have been worn down to the bare wood, there are deep stains or color differences in the wood or there is chipping/peeling..this would require a sanding and refinishing. 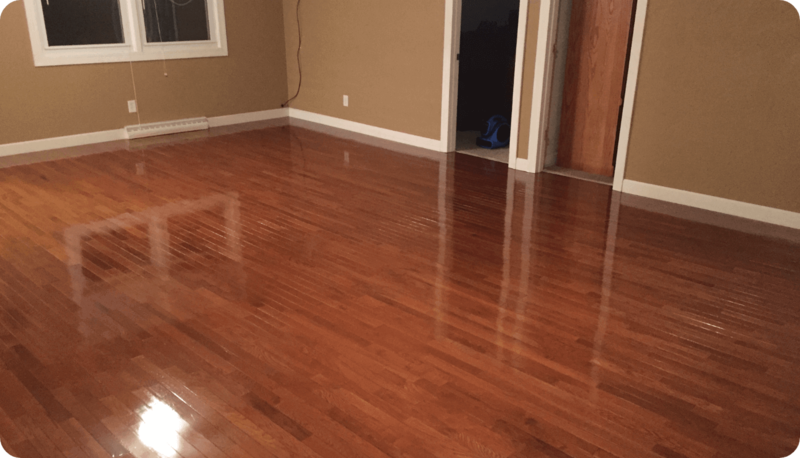 •If your floors have been previously oiled or waxed, we cannot recoat your floor because the finish will not adhere properly to oily or waxed surfaces. Your floor will need to be stripped. •If the water beads up and you can wipe it without a trace, the finish is still working and you don't need to do anything just yet. •If the water slowly soaks into the wood floor, creating a moderately darkish spot, the floor is partially worn. You may be able to get away with a recoating. •A good indication of what your floor would look like with a new coating is to simply damp mop the area in question. What the area looks like when wet is how it will look with a new finish.